The fountain of youth itself may well be a myth, but the winnings that this simple three reel and three payline slot game can deliver are very real indeed – and might even help you feel younger. A classic Vegas style slot machine with no wild symbols or additional bonus rounds, payout rates with Fountain Youth are high and stakes low, making this online slot perfect for low rollers who are aching to win some money. A relatively high RTP percentage of 96.80% makes the chances of winning money through Fountain of Youth comparatively good. The classic Vegas style of the slot is certain to appeal to traditionalists. The slot could hardly be simpler to learn or to play, thanks to its really straightforward three reel setup. Whilst the slot offers a fairly standard stake range of between 1p and £5 per payline, the fact that there are only a maximum of three paylines available mean that only lower level stakes are possible. The slot includes no wild symbols, no scatters and no bonus game. It is, therefore, a very simple and repetitive game that may find many players get bored after not too long. Whilst Fountain of Youth’s top jackpot is reasonably generous, payouts fall away rapidly beneath that and do not compare well with many other slot options. Incredibly easy to understand as slot games go, Fountain of Youth pays out as and when three matching symbols line up along an active payline. 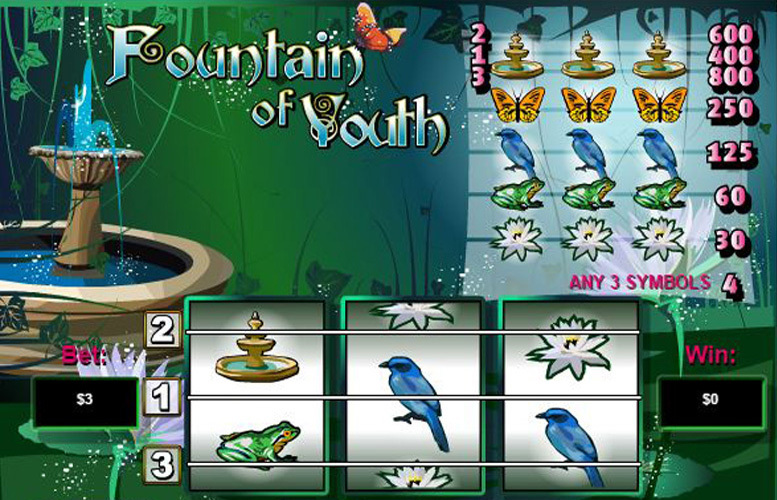 There are only a total of five different symbols featured within the game, and as you may expect the most valuable of them all depicts the fountain of youth itself. If three of those symbols line up along all three paylines – when the player has selected to have three active – the game’s top jackpot of 800 times the player’s wager is triggered. If the player selected the maximum possible £15 (£5 per line) wager, therefore, that jackpot is worth a total of £12,000. As we’ve stressed throughout, Fountain of Youth is a slot built for simplicity and for ease of play, and as such does not include any features beyond its standard three reel main game. There are no wild symbols, no scatters and no bonus round, it is just a good old fashioned Vegas style three reel slot game. As there are no wilds, scatters or bonus symbols, therefore, it is the slot’s regular symbols that take centre stage. There aren’t too many of those symbols either, actually, with just five different ones making up the slot’s paytable. Those five symbols are the fountain of youth symbol, the butterfly symbol, the bird symbol, the frog symbol and the waterlily symbol. As mentioned, the fountain symbol is the most valuable and the value of a combination of three of the other symbols is 250, 125, 60 and 30 times a player’s wager respectively. Three is in many ways the magic number when it comes to the Fountain of Youth slot, as the three reel game also features a maximum of three paylines. In order to control their betting better, however, players can choose whether to have all of those active or to have either just one or two active for each spin. Alongside that choice, players can also set their betting amount per line for further control over their stake. A minimum of just 1p per line can be staked if required, with a number of higher amounts also available, up to a maximum of £5 per line. Whether Fountain of Youth will appeal to you as a slot game option will very much depend on what you are looking for from a game. If your ultimate desire is to find a slot that’s quick and easy to understand, and can be played with very little attention required to be paid to it, Fountain of Youth will be right up your street. If you’re looking for immersive and interesting gameplay, however, you are likely to find this slot to be a little pedestrian for your tastes. Whatever your gameplay tastes, you can’t quibble at the generosity of a potential £12,000 top jackpot, but even that compares a little unfavourably with the payouts found elsewhere. This game has a rating of 3 / 5 with 472 total reviews by the users.